(1) 7th Mounted Rifles (1914, still serving); (2) 8th South Canterbury Mounted Rifles Main Body (Trooper). Passed for Rank of 2nd Lieutenant. (1914) Height 5 feet 8½ inches. Weight 140 lbs. Chest measurement 34-36½ inches. Complexion medium. Eyes grey. Hair dark brown. Sight and hearing both normal. Colour vision correct. Limbs well formed. Full and perfect movement of all joints. Chest well formed. Heart and lungs normal. Teeth fair; upper false, lower good. Free from hernia, varicocele, varicose veins, haemorrhoids, inveterate or contagious skin disease. Not vaccinated. Good bodily and mental health. No slight defects. Punchured [sic[ scar inner left wrist. Mole sacrum region. (1916) Height 5 feet 8½ inches. Weight 160 lbs. Chest measurement 35-38 inches. Complexion fair. Eyes blue. Hair brown. Sight - both eyes 6/6. Hearing normal. Lims well formed. Full and perfect movement of all joints. Chest well formed. Heart and lungs normal. Teeth good. Free from hernia, varicocele, varicose veins, haemorrhoids, inveterate or contagious skin disease. Vaccinated. Good bodily and mental health. No slight defects. Never had a fit. Had dysentry in Egypt followed by pneumonia. Fit. (1) Medically unfit; (2) On Termination of Period of Engagement. 19 September 1916 admitted to hospital, sick. 9 April 1918 admitted; 26 April 1918 discharged to duty. 22 June 1918 to hospital, sick. 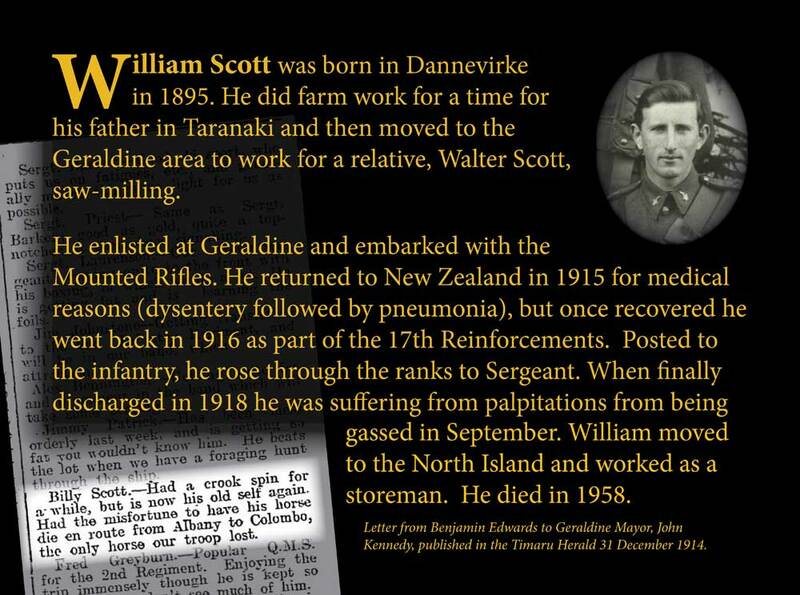 William Scott 7/119, known as Billy, was born on 26 February 1895 at Dannevirke, the elder son of Robert and Kate Catherine (née Fahey) Scott, of Birch Hill, Waitara. His father Robert Scott was himself born in the Geraldine area of South Canterbury in 1867. He had moved to the North Island while still in his teens. When the Port View subdivision on the slopes of Mt Moturoa, Taranaki, was eventually developed in the 1950s on land which had been Robert’s farm, streets were named Catherine Crescent and Scott Street as planned in the original development in 1918, on the suggestion of their daughter. William Scott was educated at various schools in the Dannevirke area – Dannevirke South, Mangatoro, Ngapaeruru, Tongaporutu. At the time of enlistment, 13 August 1914, Billy was working in the Woodbury district for a Walter Scott (likely his uncle), as a saw-miller. He had previously registered for compulsory military training at Waitara. He may well have been at the smoke concert to entertain the men about to leave Geraldine in mid August 1914. The Mayor said it was pleasing to see “that New Zealand was doing her share in upholding the Empire, and it was very good to see their own young fellows volunteering.” He had noticed that it was the most quiet and even tempered who were the first to volunteer and they showed that their patriotism was deeper than the singing of songs. The next morning there was a large gathering to see “The Boys” off, amidst band music and hearty cheers. After being instructed to muster on the Show Grounds on 15 August for final inspection, Billy departed with the Mounted Men by the slow train from Timaru on 17 August 1914, amidst much excitement in the town, whilst their horses were trucked at the Smithfield siding, Waimataitai. The Mayor spoke of the pride in them and said that they were going forward with stout hearts and strong arms. "Be true lads to your King and Empire, to yourselves and your country, and put your trust in God," he said. At the Addington concentration camp the men, comprising the South Canterbury Squadron, had a strenuous time – physical drill at 6.45am, and a lot of outfitting, overhauling gear, saddler, etc, and generally making things look smart and efficient. Embarking on 16 October 1914 at Lyttelton - probably on the “Athenic”, one of the three vessels chosen to transport troops and horses to Europe - the Canterbury Mounted Rifles men headed for Egypt and reached Alexandria on 3 December. 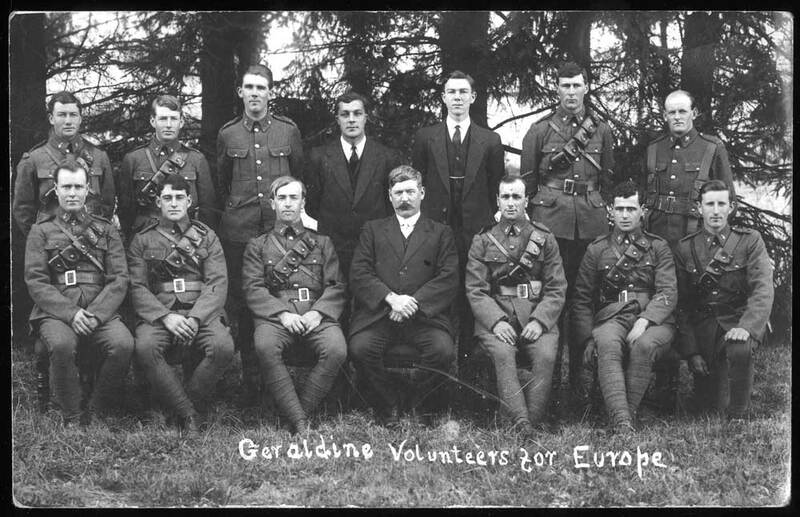 In a letter to the Mayor of Geraldine, Trooper B. G. Edwards gives news of the Geraldine men - "Billy Scott. - Had a crook spin for a while, but is now his old self again. Had the misfortune to have his horse die en route from Albany to Colombo, the only horse our troop lost." [Timaru Herald, 31 December 1914]. Billy Scott returned to New Zealand from Gallipolli per the “Moeraki” on 5 May 1915, medically unfit, and was discharged on 9 June, having had dysentry in Egypt, followed by pneumonia. William left for the front for the second time on 15 September 1916. At this time he was farming for his father at Birch Hill, Waitara. He was posted as a private to the infantry, then had several transfers while he rose through the ranks, being promoted to sergeant in the 17th Reinforcements before he embarked on 23 September 1916 on the “Pakeha”, destined for Devonport, England. Just before leaving he had a spell in hospital, sick. While at Sling he reverted to the rank of lance-corporal. In April 1918 William had more than two weeks in hospital, and then two months later he was admitted to hospital sick, only to rejoin his battalion a few days later. During all this he received a severe reprimand and forfeited one day’s pay for overstaying his pass. (June 1917). It was February 1918 when William reverted to the ranks and went to France. In April he joined his battalion in the field from the Field Ambulance. Come October he was detached to the UK. William embarked for the final return to New Zealand on 8 December 1918 (20 January 1919) per the “Ruahine”. On demobilization he was given a fairly good bill of health although he complained of palpitation since gassing in September 1918 and previously. He had also grown a little taller, now standing at 5 feet 10 inches! On his return to New Zealand he engaged in farming at Ahititi and Urenui then became a storeman and a land agent in New Plymouth. On 27 June 1923 at Stratford he married Mary Jane Dempster, a teacher, who died in 1936, leaving two children – Robert and Patricia. Some time later he married Hilda Smeaton Squire and they had a daughter. Hilda also predeceased William. In total, Sergeant W. Scott gave 2 years and 120 days of service abroad, and was awarded the 1914-1915 Star, the British War Medal and the Victory Medal. He died on 5 July 1938 at New Plymouth, aged 64 years and is buried in the Services Area of Te Henui Cemetery there. His son took responsibility for administering his estate. It is believed that Aubrey William Scott who also served in World War One was a cousin of William Scott.